So the Kawasaki Z 250 SL is still without any luggage options. But an unexpected invite to camp this weekend left me no choice but to try and load the damn thing the best way I could. I knew it would prove to be a challenge. With its narrow seat and sharp angled bottom this was not going to be easy. After an hour of getting no where I was beginning to think I would never figure it out. Every attempt was met with failure . I tried it without the panniers at first because I knew they would prove a pain to balance on the sharp angled back end and would more than likely damage the paint. But all the luggage would simply not fit on the narrow tiny back seat. Oh no we're not. Hanging too low. I tried pulling the bags this way and that but they still hung all wrong. I suspected the paint work was not too happy about all this moving and dragging about of the bags but shiny paint was really no longer my priority. At this rate it would be the 125 cc coming out instead. No wait hang on that is not really an option because time will not be on my side on Saturday so I will probably need the motorway. ..ok then ... big breaths and lets think about this carefully. I have a rummage around my bits box and find some short bungees. Ahha... what if I can use these in some way to pull the saddle bags together? This would then lift the bags higher up. I gave it a shot and hooray....success. I've been at this for over 2 hours now so I am glad it is a result. Now just to get on the bike and feel the weight.... oh dear oh deary deary me. No room for me to join my luggage on this bike...idiot!!! What a bloody fool I am sometimes, no room for me it seems. I can just about get on but hell its uncomfortable after 2 seconds so no this will not do at all. Arghhhh, I am getting rather err annoyed now as I pull off all the luggage and start again from scratch. At least this time I know the short bungees will be a help in pulling the bags together so I spend awhile finding the best way to do this. Having to push the bags further to the back of the bike so I can sit on the bike makes them hang even lower than before. So it takes some faffing about until it finally all comes together. A web on bungees carefully placed to finally achieve saddle bags in the right position and safely away from the exhaust. Ideally I would like the bags to be even higher up away from from the exhaust but this is as good as it can get. Now for the rest of the luggage. The bungees alone did not make the roll containing my sleeping bag feel very secure so out came the good old cargo net. With not many options on the bike to attach your bungees once again some thought was required but eventually I had one secure camping load on my bike. It may not be pretty but it is secure. Now for the final test...can I get on the bike ? Wahoo yes I can, why that only took me three and a half hours to figure out. Plenty of room for me too. Of course this is just a test to see if I could even manage to load the bike. I will need to do this all again on Saturday in well ...as short a time as possible, so I sure hope I remember what the hell I did this time. Oh I know I will do a blog, that will help me remember haaa haaa. Also I hope it helps anyone else presently stuck with a bike with zero racks or other luggage options. 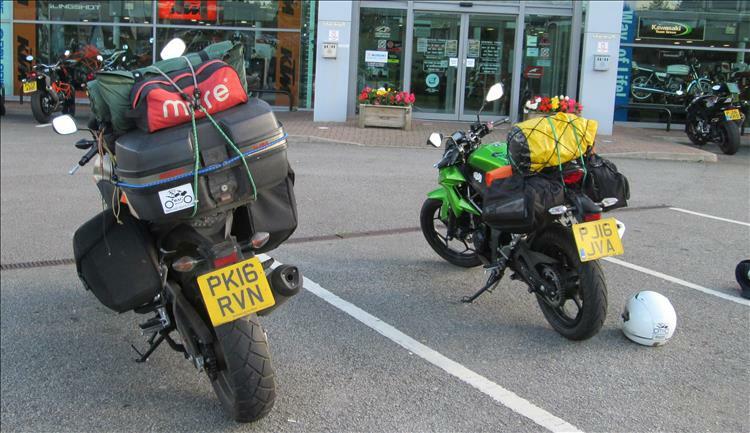 It shows with a great deal of determination that even a bike like the Kawasaki Z 250 SL who was definitely not made for luggage can be forced (if somewhat reluctantly) to carry camping gear. However I still would prefer to have some lovley c- bow pannier holders. It would make life so much easier and protect the paintwork. God only knows how mine will fare after a weekend away with the saddle bags rubbing up hard against all the sharp angles...urghhh ...need to block that image from my mind. I have done what I can with padding to protect the paintwork but we shall see by the end of the trip if that worked or not. For now wish me well on my first wibbly wobbly camping adventure on the Kwak. Lets hope we make it. Can't Ren make you something out of plywood offcuts, cable ties and old bits of scaffold tube? It used to be the case that all luggage came with "universal" fittings which managed not to fit anything unless substantially modified. I have offered to "create" something for the Kwakker Ian but regrettably Sharon is one of those people who like "nice" things. As you have so eloquently pointed out my creations are more functional but not necessarily pretty. Using the images of the racks as shown on Sharon's other post regarding the luggage I have a starter for 10. I need a piece of plate metal to create something that will bolt between the frame and the tailight/numberplate holder. This will extend out sideways with bracing to bolt onto the rear footrest plates. On either side I would affix a small piece of metal sheet on which her saddlebags could rest. This would be far enough apart to protect the paintwork and perhaps with a lip to keep the bags clear of the exhaust. I know I can create such an item. What I can't be sure of is how good it would look! It might be worth investigating the Ventura system - http://www.ventura-bike.co.uk/ . I've never used it myself but it has been well reviewed - and I don't know if there's a fitting kit for your bike. It would be worth asking them though. I must say I'm a bit dubious about hanging that weight out over the back but people do seem to get on OK with it. Ventura don't list a kit for the Z250SL. Grrrr! I know the Ventura kits I even have a few bits myself. I think they'd be ideal for Sharon's bike. My friend and contributor to this website, Stephen Latchford, has made a passing offer to create some kind of mount that would match up to a Ventura rack. Be great to see if it's possible. As for the weight Ian. Remember this bike is designed for 2-up or pillion. As such the rear seat will be ready to take an 80kg or more adult. I'm sure Sharon's load was much less than 80kg. 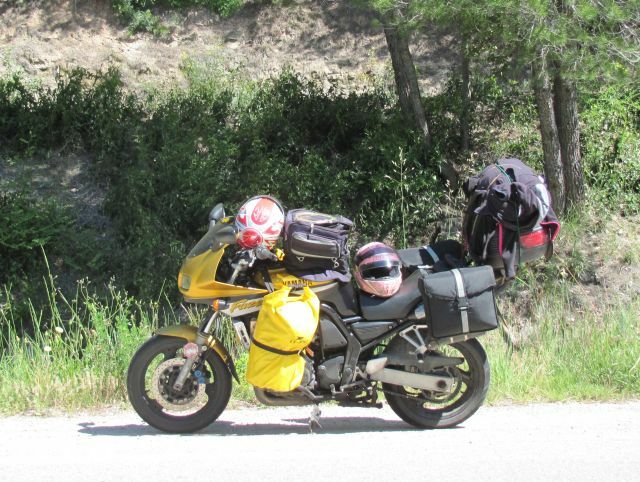 I'll write up our weekend's little camping trip soon and you can see the bike in action. It wasn't so much the weight as such, more where it is - hung out beyond the centre of the back wheel. I'd be worried about creating a pendulum effect. In the past (before you were born I expect) Norton Commandos*, which normally handled very well, were found to weave over about 80 if they had a loaded top box fitted, especially if the rider was light weight - it went away when the box was removed (as I never went above 80 myself and am as you have seen of substantial construction). *Not only Commandos of course: see link. .... should have finished "I never encountered the problem myself". Thanks Doug - yes it's a relatively new model but I also suspect it won't be a big seller here in the UK where the "bigger faster" mentality still prevails even though were all allegedly really poor these days. 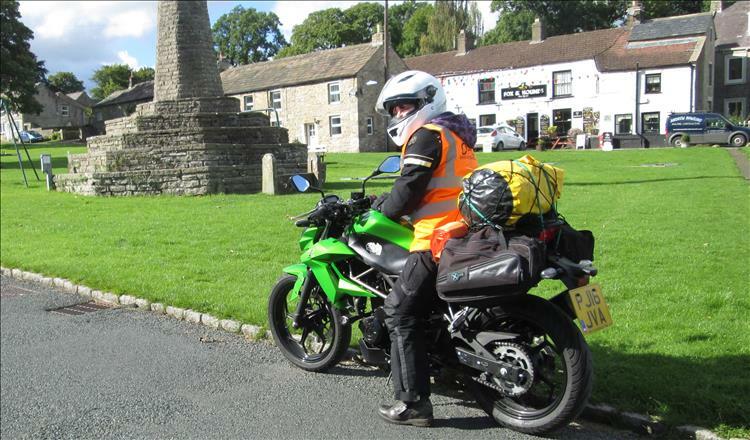 I do rather think your idea for the spare pillion seat might be a splendid idea! I could create basically a sheet of "something" that covers all the panels and provides a sturdy platform. This mean the saddle bags could be mounted along with the roll bag while the paint remain protects. Hmmmm...good call you've got me thinking. Ian - that video is a blast from the past! I've never experienced high speed weave myself either and I'm not exactly a big chap. Perhaps I've never been fast enough, perhaps modern machines are more stable or perhaps I've never been fast enough! Lovely to see Murray Walker in days gone by too. Sharon's luggage was on top of the rear seat as opposed way out back like it would be with a top box. As such I do accept you're right regarding a risk of instability but there's much less risk than myself with my top box and more luggage than Sharon. You'll be please to hear the trip went well and we had a rather splendid weekend. 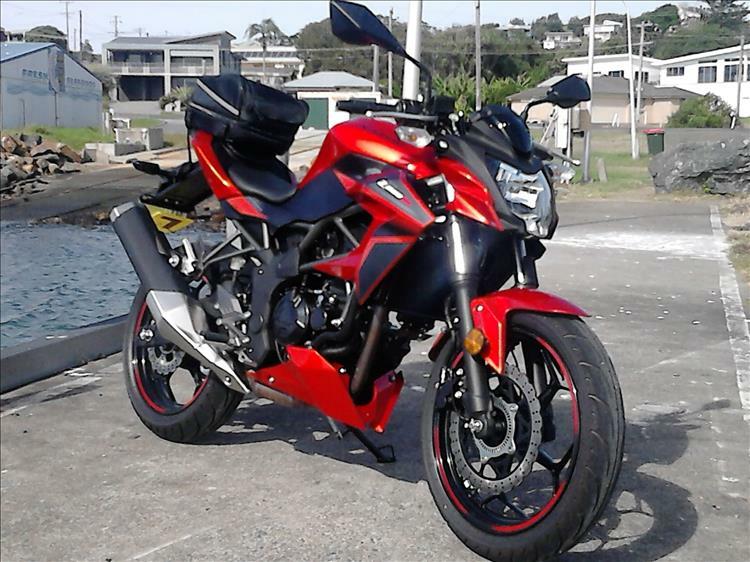 This might be something you've already considered, but there seems to be more luggage options around for the Z250/300 Ninja, could they be adapted to fit your SL?...do the two bikes use the same frame (albeit one's a twin the other a single)? I'm not that familiar with either model but looking at pictures the styling seems very similar at the back-end...just a thought! Hi Ross. While the Z250SL and the LATEST Ninja 250 SL are the same bike underneath they are not the same as the old 250 twins or the new 300 twins. You'll note on Sharon's bike the rear footrests are welded, on the twins they're bolted together. Looking at Givi's UK rack for the twins the rails utilise these bolts to anchor to. It certainly would not be a direct fitment. It would be interesting to see if the 250/300 twin racks could be adapted to fit. I'm sure they could but then I'm sure a rack off a 1970's Z500 could also be adapted to fit too! There's little point spending wads of cash in the hope it may possibly perhaps be an easy adaptation. The camping trip is almost complete. Bear with us though...we're off camping again this weekend! We've not done so much this year then all of a sudden it's gone crazy, but in the best possible way. Thanks for your post. The model code number for my Kawasaki Z250SL is BR250 E.
When I search for a BR250 I get a different model of bike than ours. The BR250 or the BR250 A which is listed on the Ventura website would therefore appear to be an earlier model from 1986-1988. If you can it may be best to contact Ventura and double check that the rack you saw is definitely for the 250 SL. If so please let us all know so we can all buy one too. Have you considered a trailer for all of the camping gear? You can also lock and leave the bike and trailer parked up, and not worry about the theft of all your gear! I have considered a trailer that's why I'm asking for details in the other post. I know what will happen. The trailer will not be fitted to Sharon's Kwakker but will end up affixed to my 500 instead. Grrrr!